One of the pleasures on studying infrastructure networks is the abundance of geographical maps. A good map tells more than a thousand words, and it is often through maps that we can gain understanding and communicate how infrastructure systems interact. Maps do not simply relay the world as it is, but rather give a particular viewpoint by illuminating and magnifying particular aspects that are of interest. 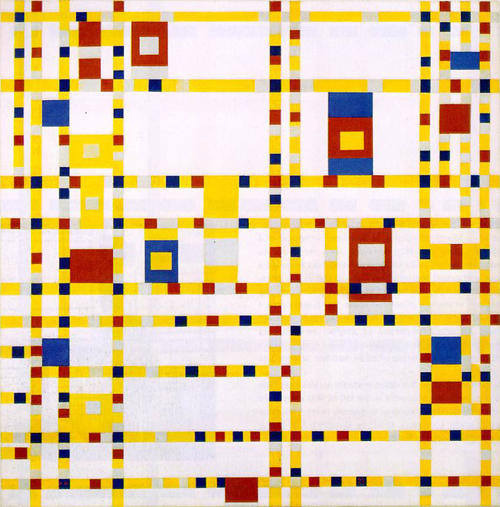 It is perhaps not surprising that artists through the years have taken maps as inspiration. 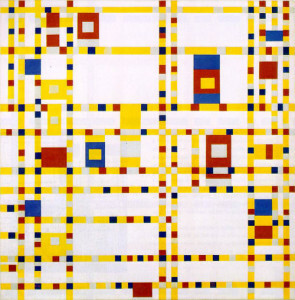 Piet Mondrian aside, even our utilitarian day-to-day maps can be awe-inspiring. The highly stylized London Underground map is a great emblem of design in the 20th century. 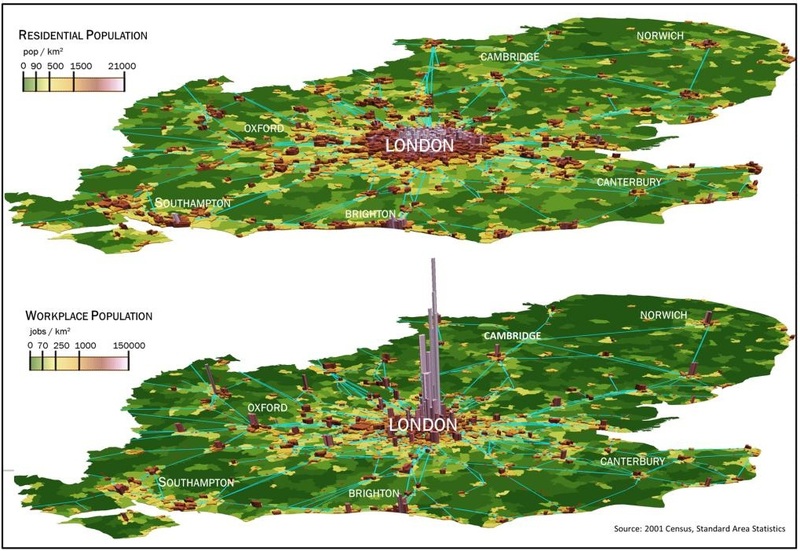 Some maps, I keep using in research presentations. Not because they are on a par with the Broadway Boogie Woogie or the London Tube Map, but because they are illustrating a fundamental point. 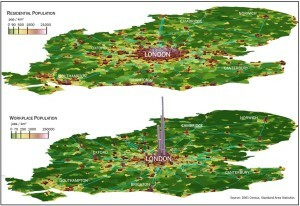 The following pair of maps, derived from UK Census Data of 2001, illustrates how differences in the spatial distribution and density of residences and workplaces are bound to give rise to substantial daily commuting streams. Smart-phones and other widely available technologies put map making power to the masses, opening up opportunities to investigate and map in detail our interaction with the infrastructure. 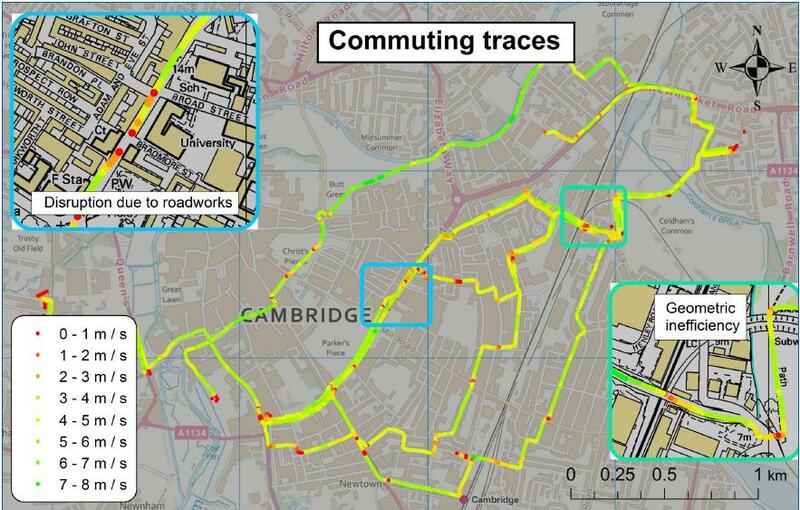 Here is one map showing my own travel speed when cycling through town. 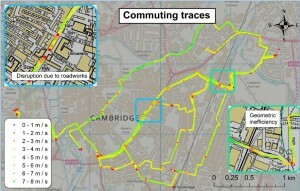 It shows how analysing individuals’ travel behaviour can contribute to understanding the performance and efficiency of the infrastructure system.